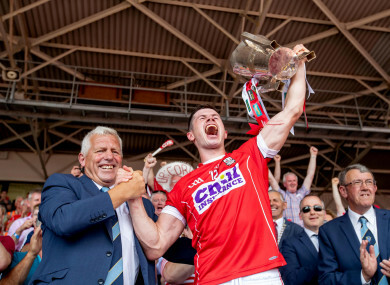 Jerry O'Sullivan presents the Munster senior hurling trophy last year to Cork captain Seamus Harnedy. FORMER CORK AND Munster chairman Jerry O’Sullivan is to bid to become the next GAA President. It was confirmed at last night’s Cork board meeting that O’Sullivan would be nominated by the county executive for the position. The next President to succeed the incumbent John Horan will be chosen at GAA Congress in 2020 before taking up the post in 2021. Horan enjoyed a landslide victory at GAA Congress in 2018 as he beat off competition from Martin Skelly (Longford), Sean Walsh (Kerry), Frank Burke (Galway) and Robert Frost (Clare). O’Sullivan is the first declared candidate but Armagh’s Ulster winning captain Jarlath Burns has previously declared his interest in contesting the position and stated in March 2017 in an interview with The Irish News that he would run ‘possibly sooner rather than later’. Cloyne native O’Sullivan, the father of former Cork hurlers Diarmuid and Paudie, has recently completed a six-year stint as vice-chairman and chairman of the Munster GAA Council while before that he served in various roles with the Cork county board, including as chairman between 2009 and 2011. “I’ve been so heavily involved in so many different roles but being perfectly honest whenever I set out, this was never an ambition of mine,” O’Sullivan told The42 today. “I love being involved. I’ve been club chairman, divisional chairman, county chairman and Munster chairman, so this is the final step. We’ll have a go at it anyway, that’s all I can do. Having declared his candidacy, O’Sullivan stated that he will later reveal the aims he hopes to achieve if elected to the position. “At this stage I wouldn’t be presumptuous or publishing any manifesto or anything. It’ll be at Congress 2020 so there’s quite a bit of time there. I haven’t set my mind on any particular aspect at the moment. Email “'I love being involved' - former Cork and Munster chairman in bid for GAA President role”. Feedback on “'I love being involved' - former Cork and Munster chairman in bid for GAA President role”.